Want to be come a certified paid traffic master? Learn how to drive quality traffic from platforms like Facebook, Google, YouTube, and LinkedIn and build a guaranteed system for acquiring customers with our Paid Traffic Mastery Certification. Learn more now. You: Hey, Google. Would it be possible to create a list for me of all the people who are likely to have recently visited my competitor websites, searched relevant keywords, or visited relevant webpages? You: Wait… what? I was kinda kidding. Are you saying you can build me a list of people like that? Google: Yes. We call them Custom Affinity Audiences. Shall we build one together? You: Err… Yes, please, Google. That was pretty much the conversation I had with my Google Rep a while ago, and ever since, I have been testing this targeting option out with YouTube and Google ads. Now, if you’ve never heard of “Affinity Audiences” before—don’t worry, you’re not alone (they were actually introduced over two years ago). I’ll define it momentarily. 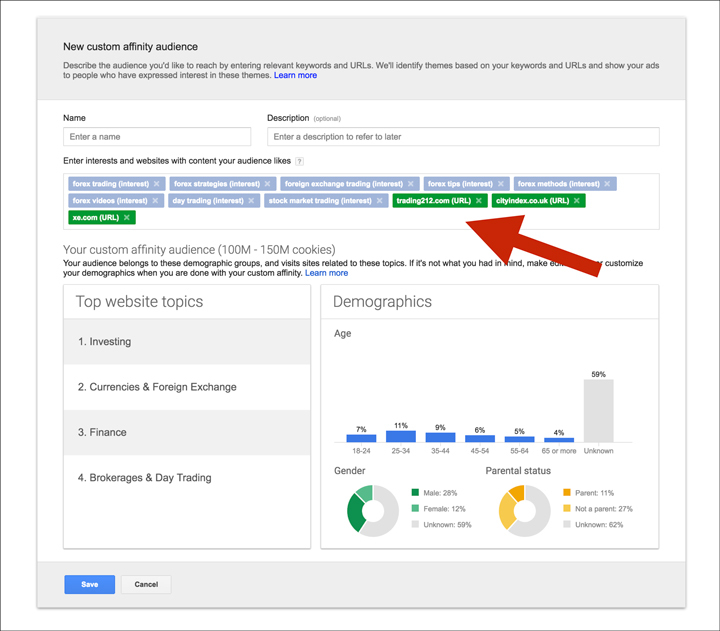 First, I want to demonstrate the power of Custom Affinity Audiences and the results we’re seeing, and then, I’m going to show you the three steps to setting them up for yourself! Below, I have a screenshot of an account we are generating £3.58 ($4.45) leads for a client that is prepared to pay nearly four times that price to turn a very healthy profit. *Results not typical and everything else, but I’m very excited by this type of targeting, and I predict that as Google’s AI develops more and more, it’s only going to get better. Now that I’ve got your attention, I’ll show you how to start creating your first Custom Affinity Audience. Full disclaimer—it’s a little bit tricky in places but don’t worry… I’ll walk you through it step-by-step. Custom Affinity Audiences. You’re Going to LOVE Them. As we all know, Google gathers so much data on all of us all the time and because of this, they started creating pre-defined audiences (that we can target) based on people’s most recent search history and behavior. 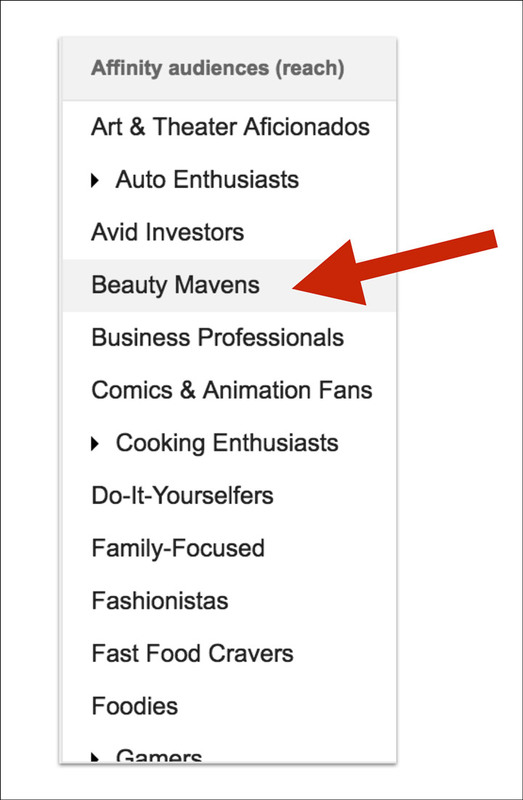 So, for example, if Mary visits various cosmetic websites, types in keywords searching for different kinds of makeup and also watches makeup tutorials, she’d likely be put in the “beauty mavens” affinity audience by Google. Google released many of these audiences and they were originally designed to help the big brands get more reach, engagement, and brand lift for their TV ads. Now, that’s great for brand awareness campaigns, but not ideal when ROI is most important. In addition, although there were a fair few affinity audiences to choose from, it wasn’t like you could choose the perfect audience for every business. A Custom Affinity Audience is essentially an audience you create yourself. You can tell Google to build tailored audiences for your business based on your customers’ most recent search behavior—people who have likely visited websites or searched keywords that are relevant to your business. Google uses the example of a running shoe company that wants to reach avid marathon runners, not just sports fans in general. The company could input the URL “marathonrookie.com,” which is about marathon running, training schedules, and marathon nutrition. Google then uses this URL to find people who browse for similar content all across the web, whether or not they visit that specific URL. What’s more—these audiences are often very large, so if you run ads, optimize and turn a profit, you can scale up in a big way. However, very few advertisers or agencies have ever actually tested Custom Affinity Audiences out, or, if they have, they’ve rarely seen any real success in terms of ROI. Now, I still don’t think I’ve fully cracked it just yet, but I’m starting to see very exciting results, and I’m going to share with you the steps that are leading to these strong results. First, log in to your AdWords account. 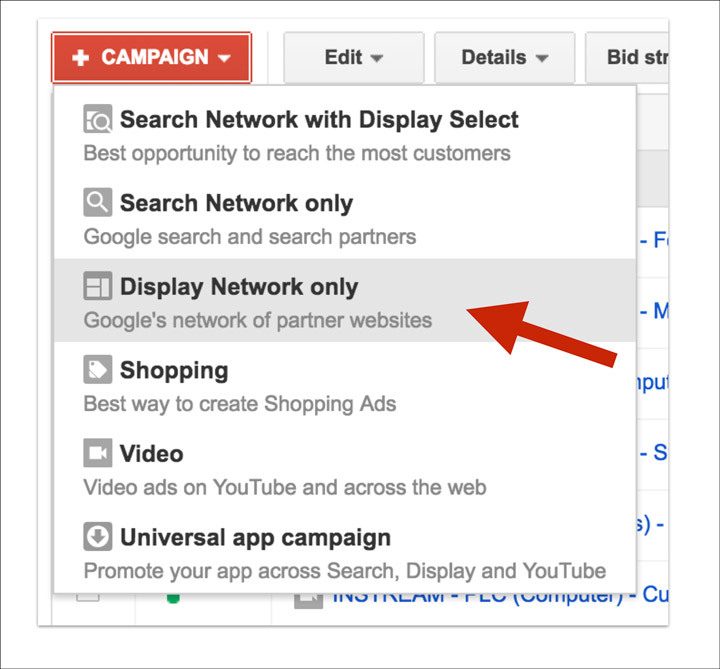 If you haven’t yet built a “Display Network Only” campaign, go ahead and build one and only fill in the essential information. 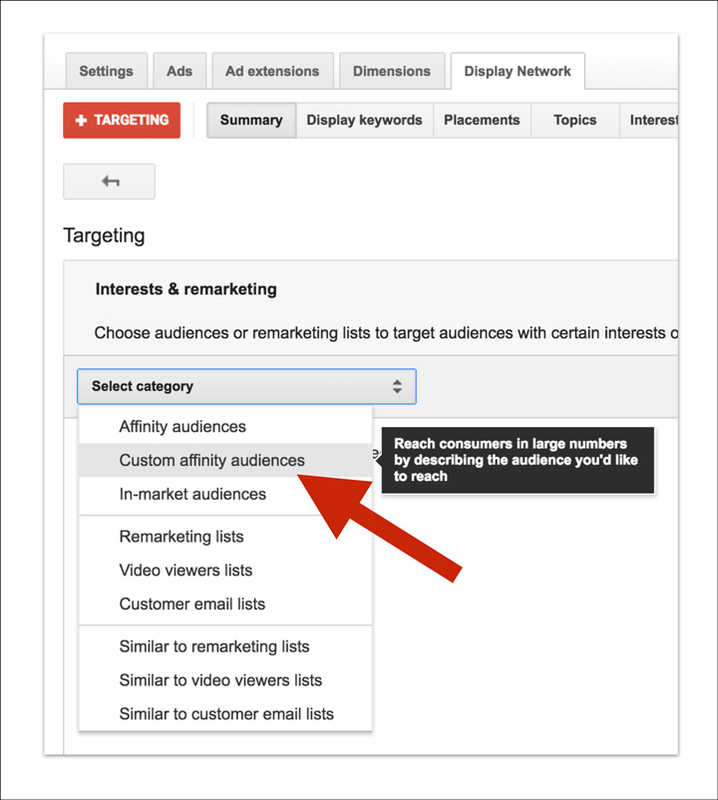 It will open up the “Interests & remarketing” targeting options and you need to select “Custom affinity audiences” in the “Select category” drop down menu. An overlay popup box will open, giving you the option to create your Custom Affinity Audience by adding keywords and/or URLs. Now, I’ll be honest here, we’re still not too sure on best practices. We’re not sure on how many keywords or URLs you should choose, whether you should go for keywords or URLs exclusively, or whether you should go for different combos. What we do know is that we have tested quite a lot already and we’ve seen some excellent results with various different combos. What I would say is build a load of different audiences using different combos and see what works for you! Once you’ve chosen your keywords (they’ll actually call them interests) and/or URLs, the AdWords system will then tell you more about the audience they have for you—how many cookies, the topics, the demographics, and so on. Pretty clever stuff! If it looks relevant, save the audience. 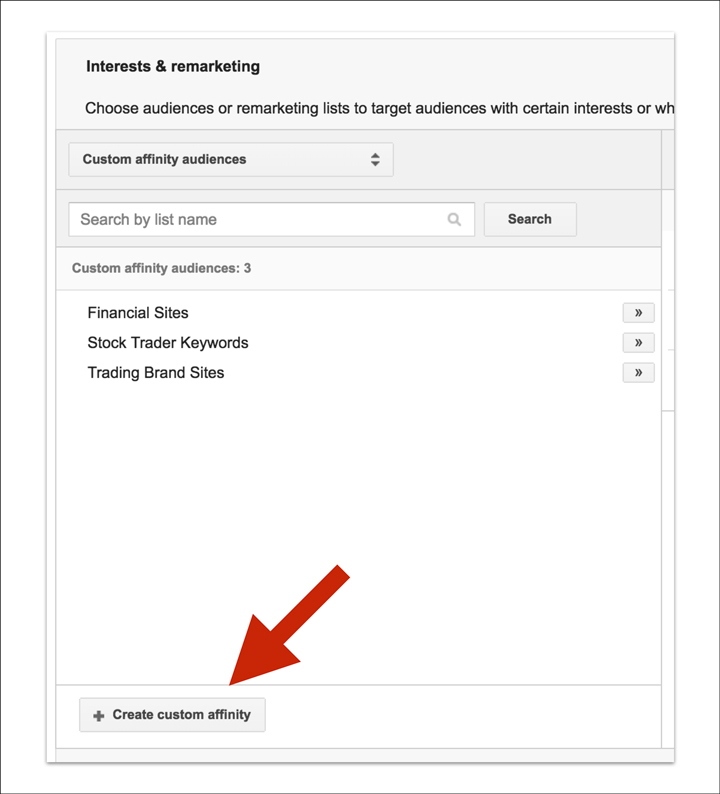 To target this audience in future, all you need to is run through these steps again, but instead of creating the Custom affinity audience, you can now select the Custom Affinity Audiences you have built. Now, here’s something you ought to know before you start running ads to these new audiences you have built. We’re finding the real key to Custom Affinity Audience success is the messaging. 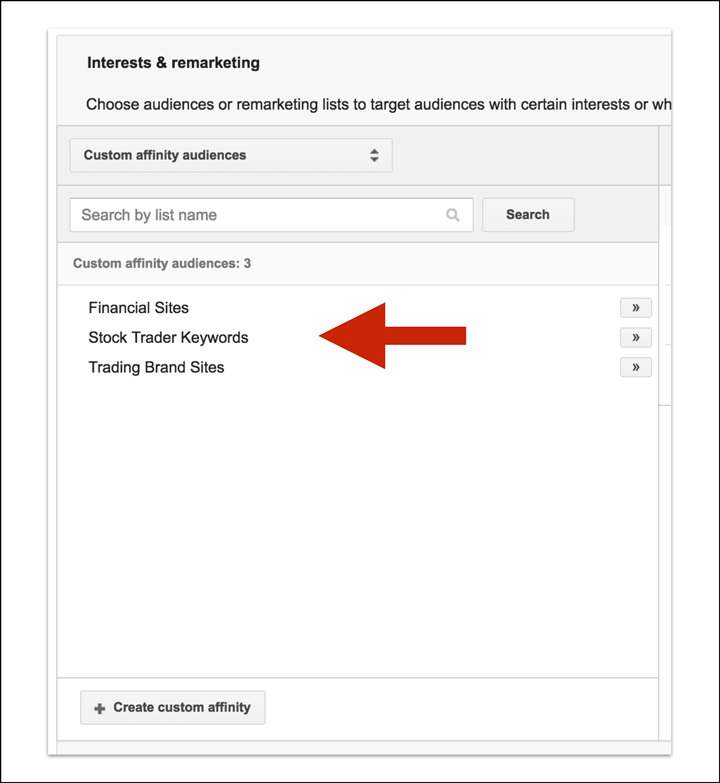 Remember, Custom Affinity Audiences plays to someone’s recent search behavior, not what someone has just typed into the search bar at that moment. Also, it’s unlikely these people don’t know who you are just yet. So, you’ve got to remember this is cold traffic. If you had a bricks and mortar store, these people would be your window shoppers. That means you need to think about how you engage and communicate your message to these people because you should never advertise to interest, search, or remarketing traffic the same way. You wouldn’t speak to window shoppers, in-store customers, and customers at the checkout in the same way, right? We’re finding that longer video ads to landing pages or short video/image ads to pre-sale content pages normally work best for Custom Affinity Audiences. Grab their attention: Starting with something like, “Did you know…” tends to work well because people don’t expect a question at the start of a video and it also opens a curiosity gap, thus keeping your viewers’ attention. Provide useful information: Unpacking a case study around one core idea is a good idea. Ogilvy found that demonstration TV ads sold four times as many people than TV ads that purely promoted a product. We find the same thing with YouTube ads. Move them closer to a buying decision: Make sure what you offer is a logical next step for the potential customer to take. And remember, try not to overcomplicate it—simplicity wins the day. 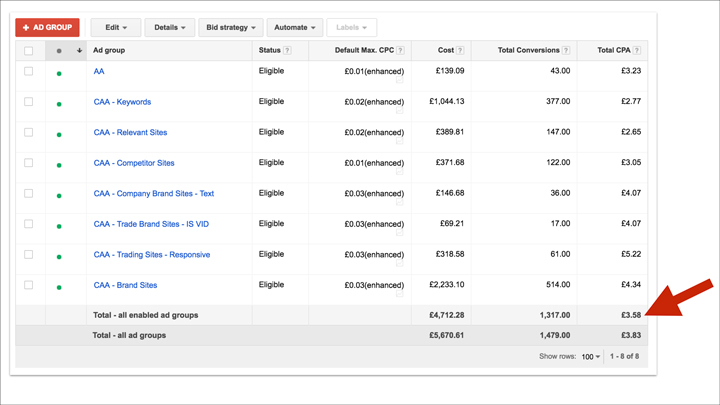 What I’d really recommend is going into your AdWords account and having a play around with Custom Affinity Audiences. Build a few audiences based on search keywords, niche celebrity names, relevant brands, relevant websites, competitor websites, and so on. If you’re in a niche industry that is well defined, with little to no ambiguity—for example, “forex trading” vs “consulting,”—then you’ll probably find the audiences you build will perform better for you. That’s what we’re noticing anyway, so try to “niche down” to a specific topic if possible. And that’s that! I’ll be back to share more of our results as we dial in the exact code to success—so keep an eye out!